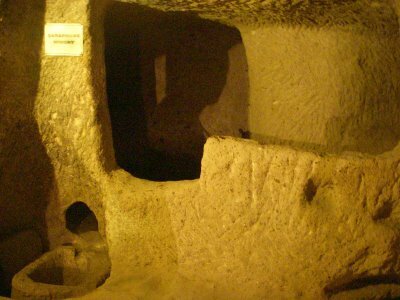 Visiting Cappadocia, a couple of the underground cities should be added to your tour. The Hittites began the process of underground dwelling and defenses around 1800 BCE. 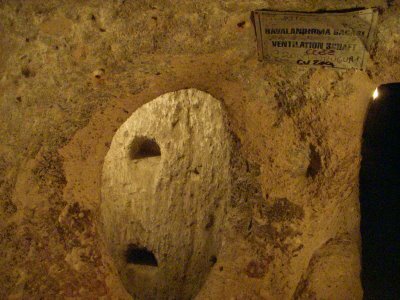 There are 200 underground cities in the area of Cappadocia and 9 are open to the public—many or these underground cities connect through tunnels. 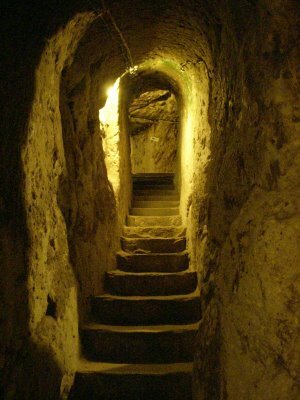 The two underground cities I visited descended into the earth 40 meters, although originally 80 meters. 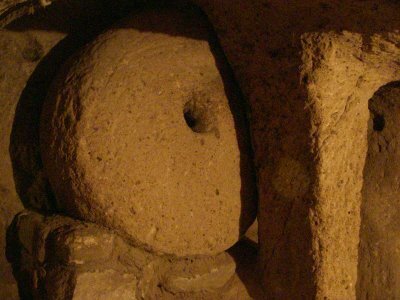 The underground cities of Derinkuyu and Kaymakli connected each other from a tunnel that is 10 kilometers long (the picture below). The Hittites built the first two levels in Kaymakli—not until the Christians during the Byzantine era, the cities were extended. In Kaymakli the city was extended 6 to 8 more levels down into the ground. 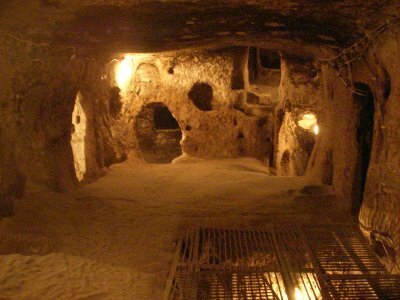 I decided to hire a tour guide at the underground city at Kaymakli for detailed information. The ventilator shaft (picture above) descended to an underground river for the water source and air source. They created bedrooms where they dug out compartments into the wall for blankets and clothes. 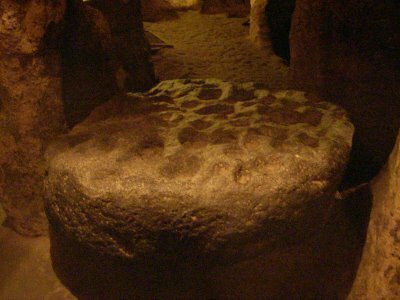 The oven area they built for bread was down on the four or fifth floor, the smoke would ascend separately so the underground city would not be detected from above. They used jars for bathroom needs and carried the jars to the top floor where the stables were built. They had a church, a winery, a washroom for clothes; they created a phone system by drilling through the levels and by using pipes. The wheels were the doors that could only be opened from the inside, the hole was used to shoot arrows at the invader. The people dwelled underground for long lengths of time, an unhealthy atmosphere blossomed from illness, and human smell, etc., nonetheless, the concern for safety will lead to extreme measures and mind boggling man-made wonders. The spice and garlic masher. A totally incredible experience descending 40 meters into earth, into a complex where people lived for up to six months at a time. I personally was not claustrophobic, although a few people from some groups decided to not enter underground. 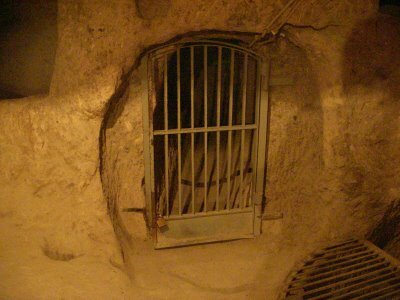 Next post: The Caves of Heaven and Hell.